I really love this job. I just got to spend a glorious fall afternoon, travelling all over a golden, amber and red city, watching the leaves scud past me, and gulping big lungfuls of fresh autumn air. When my fingers got cold and I felt a chill, I would duck into the doors of small shops, and breathe in the heady smell of chocolate. Yes, it is the time of year again, when making soup, apple crisp and hot chocolate make so much sense. The nights feel snappy and crisp, and we have turned the furnace back on. And soon, it will be Hallowe’en. I love Hallowe’en. I love its wildness, I love that you venture out into the night to participate in it, that you dress up in costumes, and then come home with a pillow case full of loot – just like a pirate! No, I don’t still trick or treat, but I love the giggles, whispers and excitement on the other side of the door, as the kids approach it, shifting and wobbling in their costumes, and the expressions of delight under the make-up and masks that can be discerned, if you happen to be giving out their favorite kind of chocolate bar. I got to go on my own little grown up version of trick or treating, this week. 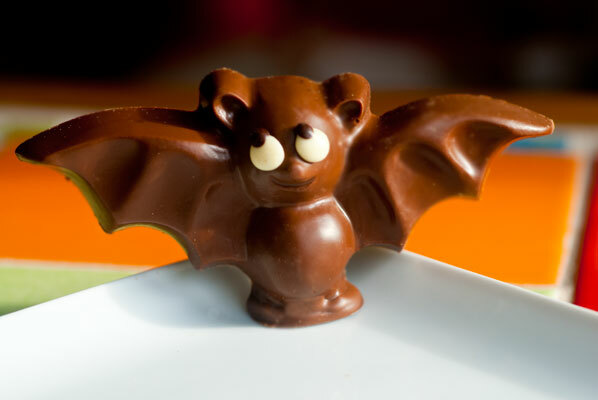 I set out to find out what “Special for Hallowe’en” treats are being offered by some of our finest local chocolatiers. These are not the mini chocolate bars to be gorged on and sickened of, in a few days. These are the “one small perfect piece” kind. I am very glad I thought to look on the Chocomap.com before I set out, because Chocolate Arts has moved location, to enable them to be reunited with their production kitchens. They are undergoing a major renovation which includes a café, retail area and an open plan kitchen where patrons will be able to watch the chocolatiers creating, and allowing them to host classes and events. Their products have always been beautiful, incorporating the designs of local artist Robert Davidson, and using fresh local and organic ingredients. The chocolate flavours change with the season. 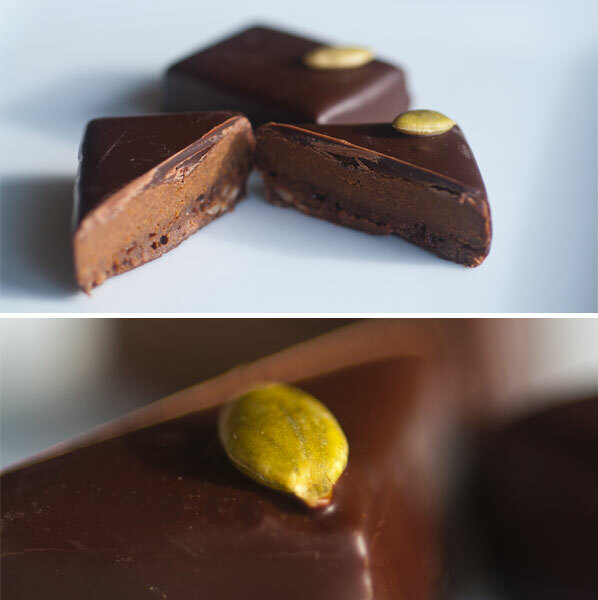 Pumpkin & Praline: roasted local organic sugar pumpkin puree, spices, Appleton rum, vanilla, crunchy almond praline & milk chocolate, enrobed in dark chocolate, pumpkin seed on top. Oh, these are perfection. A small square of creamy chocolate, giving way to a spicy ganache, and delicate centre, finished with a slight crunchiness. So pretty to look at, with a tiny perfect pumpkin seed in one corner, they are only around for October. Gemma at Chocolate Arts warned me of this, as they have to make way for so many winter and Christmas flavours. I always love stopping in at Cocoa Nymph, as it is right on my path to the University of British Columbia. One of my fun and eccentric sideline jobs is working with the medical students there, as a Standardized Patient. I have a little ritual, on the approach to Cocoa Nymph of whispering to myself, “Okay, if there is a parking spot right in front, I’ll go in”. There was, and I did. Although pressed for time, today, I give a big sniff, go “ahhhhh” and find myself wanting to curl up in a corner of Rachel Sawatzky’s cozy little living room of a shop. Today, there is the temptation of stopping for a black pepper drinking chocolate with salted caramel marshmallows. I had this heady combination last year, and know how delicious it is. Perfect for warming up fingers and toes, and also perfect for people who don’t like their hot chocolate to be too sweet. I steel myself, however, and stop only long enough to pick up some pumpkin spice truffles, for later. The staff at Cocoa Nymph are so friendly and knowledgeable, and the rich smell of something buttery bubbling in the kitchen keeps me chatting for too long, but I must press on. I sprint out, truffles in hand. 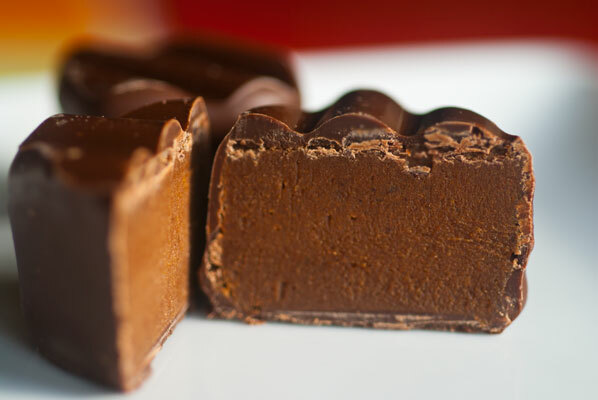 Pumpkin spice truffle: pumpkin caramel ganache, cinnamon, nutmeg and ginger in milk chocolate. These are generous in size and taste, and definitely remind me of a slice of spicy pumpkin pie – but much better. We cut them in half, to make them last longer, but they still disappeared in about as long as it took to photograph them. I love the combination of cinnamon, ginger and caramel, and the slight hit of pumpkin was very mellow, smoothing the feel of the chocolate, and adding a wee bit of velvet. 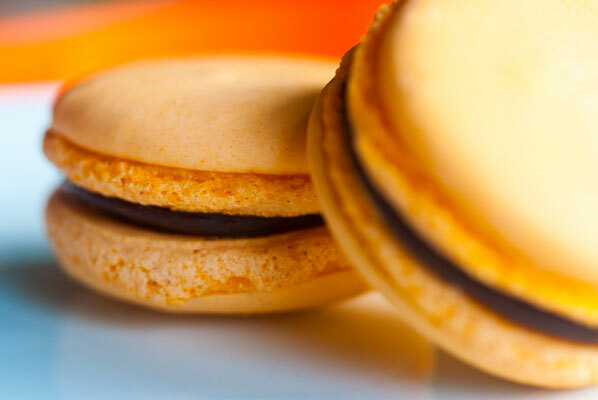 Orange and Chocolate macarons (delicate light almond meringues filled with a layer of creamy dark chocolate ganache). I am so happy when I discover, later at home, that my family is so full from the other chocolates, they are content to take only a small bite of macaron. I convince myself they cannot possibly stay fresh for more than a day, and soon, I have polished off the entire half dozen – but I did go for a long wet, woodland walk and a yoga class – and they are so light and delicate, and melt deliciously on the tongue – really, I needed half a dozen to fully do them justice. And I have not yet tried the other flavours. Perhaps a long, wet walk to Thomas Haas’ store is in order, this weekend. 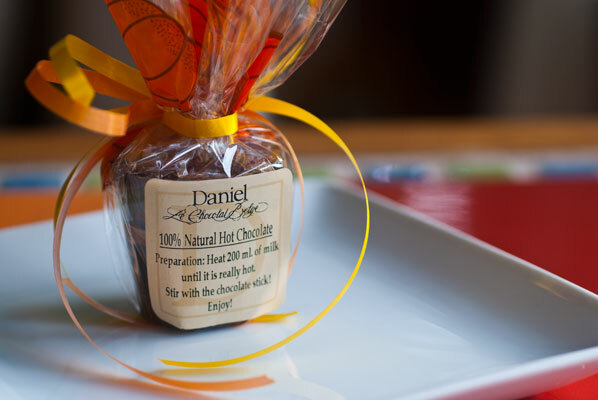 Stopping in to the factory store of Vancouver institution, Daniel le Chocolate Belge, has become another little ritual of mine. Whenever I have an audition at Shoreline Studios, across the street, I pop over to the factory store afterward, and ring the doorbell, to see if they are available. There are always samples of what they are making that day, and I love being greeted by the white smocked, hair-netted staff, who have just stepped off the factory floor, and seem delighted to spend a few moments serving, before getting back to making chocolate. Today, there is a clever little idea for warming up the wee ghosties and goblins before they set out for a chilly evening’s Trick or Treating, or perhaps for a warm up upon their arrival at home. 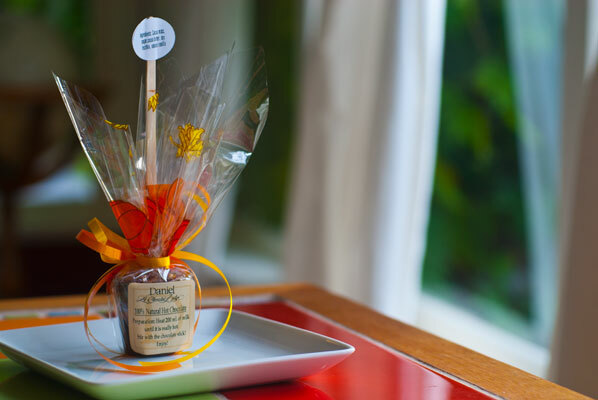 Hot Chocolate on a Stick is simply that – a cup of dark milk chocolate on a wooden lollipop stick that is submerged in a cup of steaming milk, and swirled about until the chocolate melts into it. A very simple idea, which proves to be quite delicious, and I know I will be borrowing it for our own Hallowe’en festivities. Chocolate Arts’ – “smiley faced” bat: in white, milk and dark chocolate (milk shown here) – I think she is particularly cute, with her big, wistful eyes and fat belly! 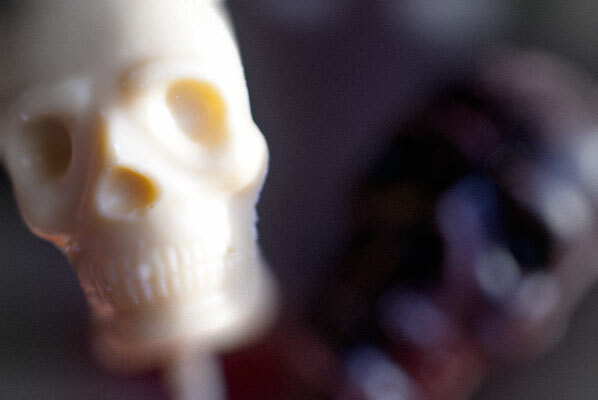 White, milk and dark chocolate skull lollipops (dark and white shown) – I like the definition in these, and there is something weird and wonderful about eating a head! And finally, although they are not local to me, I do make a pilgrimage to their shops when I am in Portland, visiting my sister. 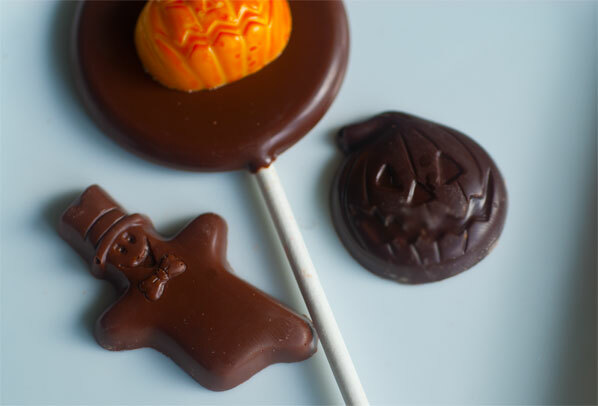 I am on their mailing list, and laughed out loud when I received the Hallowe’en update from Moonstruck Chocolates, the other day. Chef Julian Rose definitely has an eye for the whimsical. It is worth it, even for the entertainment value, although they all sound delicious, to check out their Fall and Hallowe’en collection, including the Blood Orange Bat Truffle, Peanut Butter and Jelly Eyeball Truffle, and the Popping Frankenstein truffle (milk chocolate, Oregon hazelnut praline and popping candy ganache, inside a freaky hand-decorated Frankenstein head). Hmm. I think I’d better get back down to these shops for a few more of these highly seasonal treats before they disappear with the ghosts of Hallowe’en!